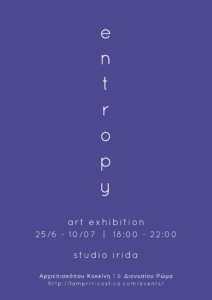 The word entropy finds its roots in the Greek entropia, which means “a turning toward” or “transformation.” The word was used to describe the measurement of disorder by the German physicist Rudolph Clausius. A common example of entropy is that of ice melting in water. The resulting change from formed to free, from ordered to disordered increases the entropy. I searched for myself -and to comprehend it- I grasped the space… putting in order feelings and thoughts, through the struggle with the beasts that rise up in the day… recording the defeat, the defeat as a starting point for overthrowing and reducing inner entropy… in an endoscopic effort of what it means for one to be a whole world… and ultimately as opposed to a whole world as a dumb vessel.